End the lesson by giving children an opportunity to ask questions and talk about the book. Use this time to check for children’s understanding of the text, add to the anchor chart, revisit the learning objective, and bring closure to the reading experience. The purpose of any activity after reading is to provide children with an opportunity to synthesize their learning, respond to the text in both general and specific ways, and find meaning in the story. Teach your children how to have interesting, focused, and respectful group conversations. Model, practice, role-play, and monitor your children’s discussion skills, just like you would any other classroom procedure. Foster a classroom experience in which everyone participates in discussion to send the message that all children have something important to say. Conversations are opportunities for children to develop compassion for other points of view. Use these suggestions to introduce and teach conversations skills with your children. Show children how to arrange themselves on the carpet for discussions. Try moving children into a circle so everyone can be seen and heard. Have children practice this as quickly and quietly as possible (timing this can turn it into a fun classroom challenge). Make sure children let peers finish their thoughts without being cut off. This is not an easy skill for children, especially when they are excited about learning! Use a “speaking object” such as a decorated stick to practice taking turns in a discussion. Whoever is holding the stick has the floor until the stick is passed. Have a clear “no put-downs” rule. This fosters an atmosphere of trust in which children will take risks. You may want to have a “ten seconds of silence” rule if put-downs or name calling are used, to interrupt the cycle and let everyone re-gather their thoughts. Help children focus their attention and build listening skills. Show children what it looks like and sounds like to be a good listener. If you do this explicitly for the first few weeks, children will learn to do it implicitly. Teach children to base their ideas on accurate information and support their opinions with evidence. Teach children to stay on topic and connect their thoughts to what others are saying. Young children often pipe up with new or unrelated ideas, rather than respond to previous contributors. At the beginning of the year, ask children to direct their comments directly to the person who spoke before them, so they are “talking back” instead of just talking. Model, practice, and expand this skill. Create an anchor chart with conversation stems for children to refer to help them connect to other’s ideas, agree, and disagree politely. Create checklists or rubrics so children can assess their own conversation skills. Teach children what a good conversation looks and sounds like. Be patient with yourself and your children. Recognize and expect that children’s conversation abilities will grow with practice. Model and reinforce skills each day and celebrate effort and improvement. Help children learn with and from each other by having meaningful and respectful conversations about the read alouds. Teach children the following sentence stems to help them talk with each other. Could you say more about ______? Can you explain what you mean when you said ______? Accountable talk is talk that is meaningful and precise and helps people in a community learn with and from each other. Foster accountable talk with your children by eliciting and asking questions and listening carefully to what they have to say. Teach children how to listen attentively, and how to agree with, add on to, or disagree politely with what others have to say. The ultimate goal is for children to talk to and listen to each other in ways that deepen individual ideas and collective understanding. accountable to supporting their ideas and opinions with evidence. accountable to the learning community by listening to and reacting to other people’s ideas by agreeing, adding on, or disagreeing. Discuss the WHY behind accountable talk. Begin by modeling a conversation with an adult, if possible. Ask children to reflect on conversations. Ask questions like: What is happening that makes this a good conversation? What are the bodies and faces doing as they talk? How are the people acting towards each other? How are they treating each other? Chart behaviors on a Purposeful Talk anchor chart. Teach strategies for active listening. Teach conversation stems for reacting to other people’s ideas. When children are acquiring a new language, their receptive language skills tend to develop in advance of productive language skills. ELLs may understand the discussion in the classroom but may feel reluctant to participate or have a difficulty with the language needed to express their thinking. When children have scaffolded supports including sentence frames it will relieve the linguistic load and encourage them to participate. Repeat key words and phrases for children. Create opportunities to use context-relevant speech in multiple subject areas (from the morning meeting to whole group literacy discussion). Reduce affective filter through the creation of a collaborative and supportive environment that encourages all children to participate and make errors. Give rich and pointed feedback. Ask questions when you don’t understand a topic. Can you give me another example so I can understand? Give a reason why your idea is a good one. Ask for evidence when you hear something that sounds incorrect. I am not sure that is right. Can you tell me why you think that is true? Can you point to the place in the book that shows that idea? Read a part of the book that supports your idea. Bring another book or source to support your idea. Give children time to have conversations with each other (see questioning stems below). Choose informational texts and fiction to read aloud and share. Select shorter texts so that time to talk is built in. Work with small groups to practice accountable talk through book clubs and literature circles. At times, open with questions like, “So how’s it going?” to encourage children to express what is on their minds and to practice talking and listening. Teach children how to have conferences with each other. Provide regular opportunities for children to talk with other children about what they are reading and writing. Preserve and cherish the share time. Stick to the workshop schedule of mini-lesson, work time, and share. Consider moving share time to the beginning of workshop a few days a week to prevent running out of time. Consider gradually releasing the responsibility for sharing to the children so they describe and reply to each other’s learning. Create mini-lessons that allow for children to share ideas. 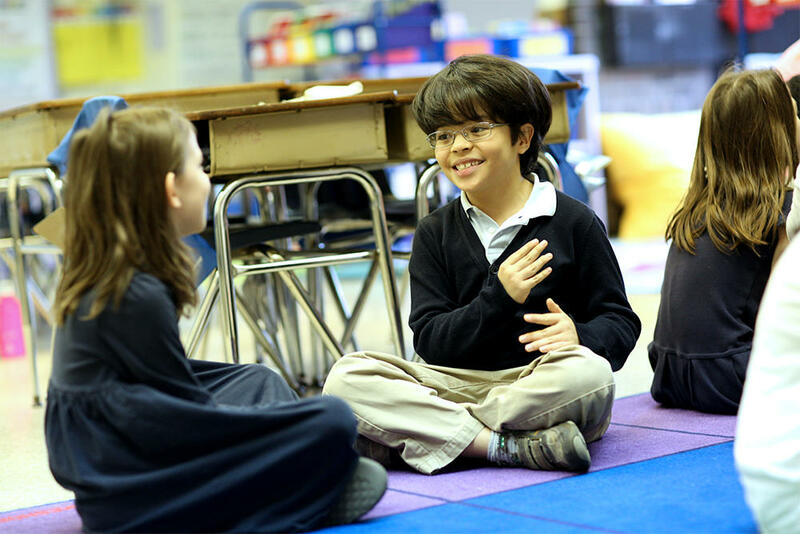 Ex: Allow children to sit in a circle to discuss what topic they are writing about and why it was chosen.